If you have ever been to a weekly pazar (market) in Istanbul, you’ll know it is nothing like the neat-aisled Migros or Şok markets on the corner of your street. Pazars have an authentic feel sheet-covered streets, which turn the markets into a kind of sanctuary of fresh food. The hectic shouting of vendors to passersby, children running between stalls, and colorful piles of produce and goods in every direction will leave you mesmerized. I love listening to the calls of the stall keepers “Bir lira! Domates! Kilosu üç lira!” And if you’re lucky, you will hear old men singing Anatolian songs as you hand over your Lira. Going to the bazaar is the highlight of my Tuesdays. The smell of fresh produce always puts me in good spirits as I stroll through the long winding street in Emirgan. The best time to go is in the morning when the sun is shining and you’ll have the best choice of vegetables and fruit. Before purchasing anything, I first walk the entire pazar to get a look at the prices as they change every week. Men and young boys generally work the stalls, but I’ve also seen women filling the plastic buckets with pomegranates and apples. Everything is priced per kilo and I am still surprised every week at how cheap the prices are. You’ll leave the pazar with heavy bags and full pockets. Make sure to bring cash though as your MasterCard is useless here. Don’t miss your chance to experience a local pazar! 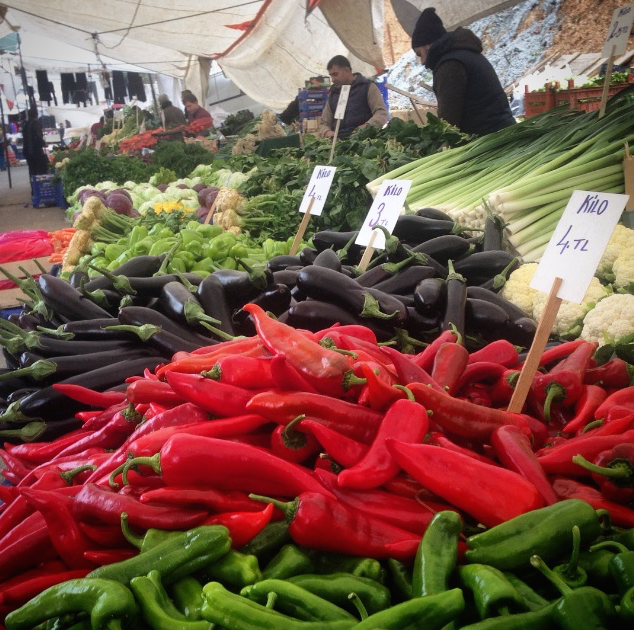 Turks prefer to buy produce that is both seasonal and regional to Turkey. Most of the produce is picked weekly and I can taste the difference between my pazar bananas and those purchased in the supermarket. It’s okay to try free samples throughout the market and you’ll see Turks tasting grapes, cheese, nuts, olives, mandarins, and everything in between. My favorite stalls have giant barrels of olives lining the front and I practice my Turkish conversation skills as I’m offered countless delicious samples. If you are like me and in the process of learning Turkish, the pazar is a fantastic place to practice. The vendor’s English is limited and some unscrupulous types try to cheat customers if they know you are foreign (always count your change!). It’s best to try and avoid speaking English when paying and try your hand at Turkish instead. Kaç Lira? – What is the price?/ How much? Kilosu ne kadar? – How much for a kilo? Bir/Iki/Üç kilo. – One/two/three kilos. Bunlardan alabilir miyim? – May I have some of those? Located under a triangular modern dome, the Beşiktaş Fish Market runs everyday. Most major pazars in Istanbul operate one day a week and the locals flock from surrounding neighborhoods for the best prices and freshest picks. If you are staying near Taksim, Tarlabaşı Sunday Bazaar is worth visiting. 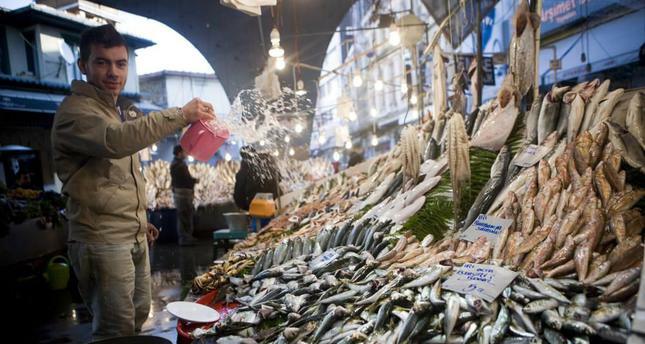 On the Asian side, the Kadıköy market on Tuesday’s boasts the freshest fish in all of İstanbul. And in the old city, Fatih has a huge marke every Wednesday. You can find food pazars in most major neighborhoods in İstanbul. Once I get my groceries home, my day of cooking begins. Women do most of the cooking in Turkish culture, but that shouldn’t stop you men! A culture shift is occurring with the younger generation of Turkish men knowing their way around the kitchen. Cooking authentic, Turkish food at home is easy, delicious, and a big part of their culture. Turks don’t understand the Western culture of buying processed or frozen food. So, I was determined to learn some recipes, and (top tip alert!) they all begin with a good quality bottle of oil. 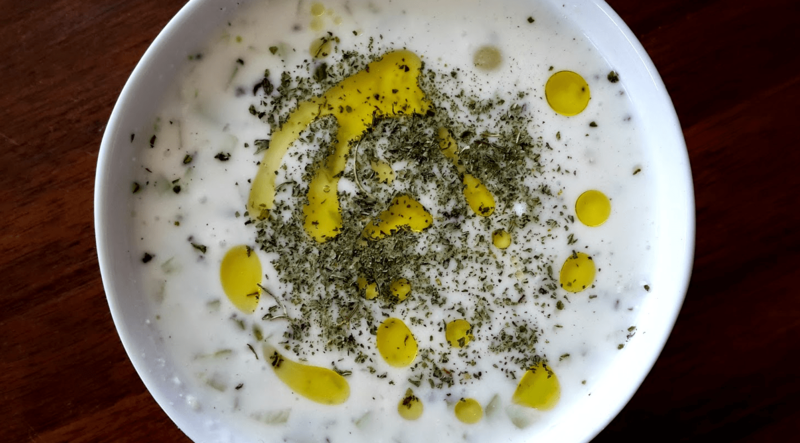 Cacık is a refreshing yogurt-based dish. The cold soup is made of yogurt, water, cucumbers, dill, olive oil, and salt. Two of my favorite Turkish recipes are Cacık and zeytinyağlı kereviz. I take advantage of these recipes as you won’t find thick Turkish yogurt and celeriac everywhere else. Both recipes are for beginner cooks and you’ll have great dishes in a short time. When Turks cook they often make more food than necessary and bring extras to thei neighbors. The sharing culture extends even into simple meals in Turkey. Living with a Turkish family recently I have come to appreciate mealtimes, which are as much a social event as a daily necessity. We can sit and chat for hours over a meze-style dinner, sharing lots of little plates. I have begun to recognize the odd quirks at the dinner table, like saying Afiyet Olsun (Bon Appetite) before and after a meal! Turks love to know that your stomach is happy at the end of the night, so I make sure to thank my Turkish host mother several times. With gracious company and a relaxed dinner atmosphere, you’ll soon be dining like a true Turk!